This was our first time reading Mailing May, so I did the lesson from the manual on the cover illustration. Eliana guessed that May was going on a trip, but never guessed that she was being mailed to get there! Yes, Mailing May, based on a true story, is about a little girl, who in 1914, is mailed to her grandmother in Lewiston, Idaho for 53 cents in stamps! We had fun with this one! We started out with an art lesson on how to braid that turned into making a braided rug, learned about healthy eating habits, went on a field trip to the post office, mailed some "unusual" items, and more! Then we did a unit from Visual Learning Systems called Healthy Eating Habits. See more of what we did in my review. We each made a healthy meal plan. And lots of Good Girl Moonshine to sip throughout the day (I use ginger and lemon essential oils in mine!). My husband is from Idaho and we've made many visits for family reunions. Idaho is famous for it's potatoes, and we will have potatoes with our recipe this week. May says she feels "as adventurous as Daniel Boone" so we read Daniel Boone, by Arthur Guiterman from Favorite Poems Old and New - page 428-430. My friend, Jenny, lives in Dayton and knows the owners, so she arranged a special field trip for us! The couple that bought the mercantile had intended to turn it into a home. Here is their beautiful new kitchen! A store! Right in their home. :) The town asked them to keep it as a store and they were happy to. Old fashioned peppermint sticks like in the book! Upstairs in their home, is a museum of animals that the husband has hunted and collected from all over the world and we also discovered that he collects stamps! The oldest one dates to 1939 - just 19 years after May was mailed. 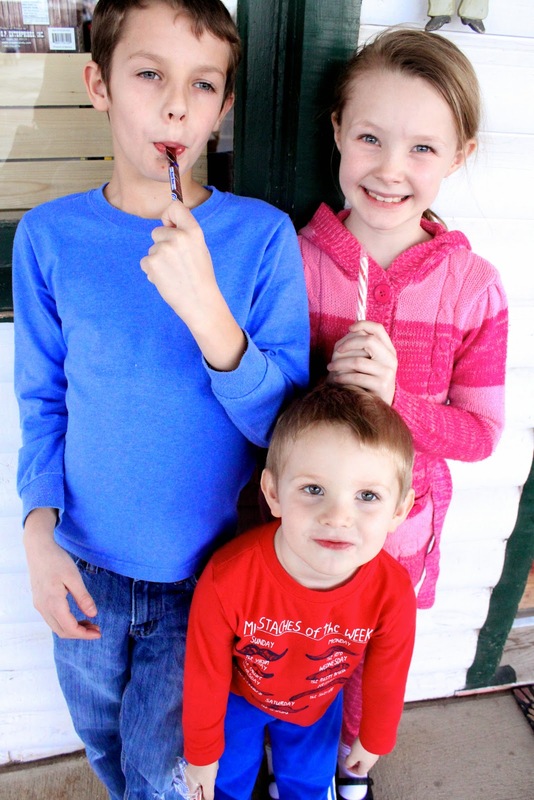 I had planned to make homemade peppermint sticks, but after seeing them at the mercantile, I let the kids each buy one (phew!). How much is a single stamp? a roll? a sheet? We toured a post office in Dayton. A cute little post office! Our post office is bigger, but still very old fashioned. May's weight is recorded and stamps are purchased according to her weight so she could be mailed to Lewiston, ID. We did weights and measures with the old postal scale at our post office. 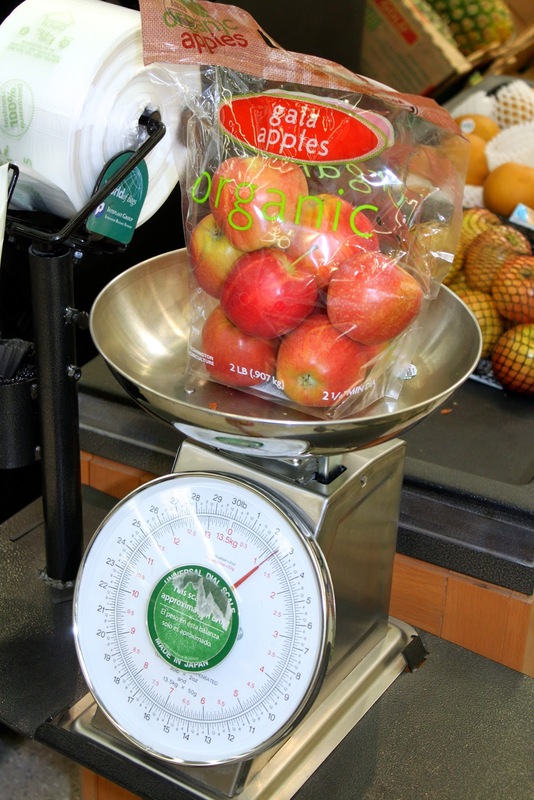 We weighed some "unusual" items to weigh to make sure they were 13 ounces or less. A ticket to ride the train cost $1.55, but it only cost $0.53 to mail May. Eliana covered how to write 50 cents in cents and dollars in her Math Lessons for a Living Education, so that was a nice tie in. 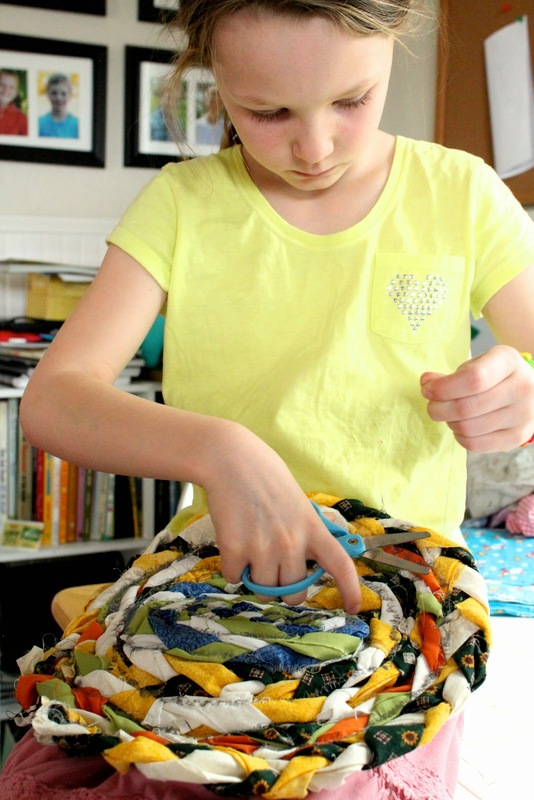 I fell in love with the idea of 13 Ounces or Less via Kids Activities Blog - Unusual Things You Can Mail and planned right away to mail some unusual items for our row. Jumprope, bouncy balls, Sky Bouncer frisbee, and a plastic baseball bat and balls to local friends and to the boys of a blogging friend (who wrote the cutest thank you letter back!). I was unsure about the mailability of our items, but this Happy Mail How-To was super helpful. While you can mail unusual items, the postal lady on duty seemed a little impatient to have to sell so many stamps. I bought Elli various stamps to start her own collection. Including the Inverted Jenny, which was her favorite. We covered aliteration for "Mailing May" and came up with a few including Marching Malachi. Shopping for our healthy ingredients. Ingredients for our Chicken Pot Pie, salad, and fruit for dessert. We didn't end up making our meal. I put the chicken in the crock pot and we had chicken enchilada soup one night and I had intended to make the chicken pot pie the next night, but we had leftover soup instead. I used the rest of the chicken for chicken salad sandwiches on our trip. But guess what?! Luke's aunt had chicken stew waiting for us the night we arrived at the Grand Canyon - chicken pot pie without the crust! 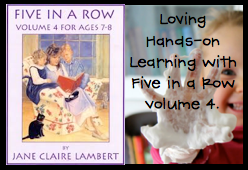 FIAR Recipe: "Grandma's Butterscotch Cookies"
Mailing May is a Five in a Row selection from volume 4. You always make a FIAR unit study so awesome. I miss the books and never read Mailing May. We are doing Neil Armstrong right now from Beyond FIAR. What a fun, hands-on row! I bet your kids will have wonderful memories of the learning experience. Great pictures! So glad we could participate in part of your row. 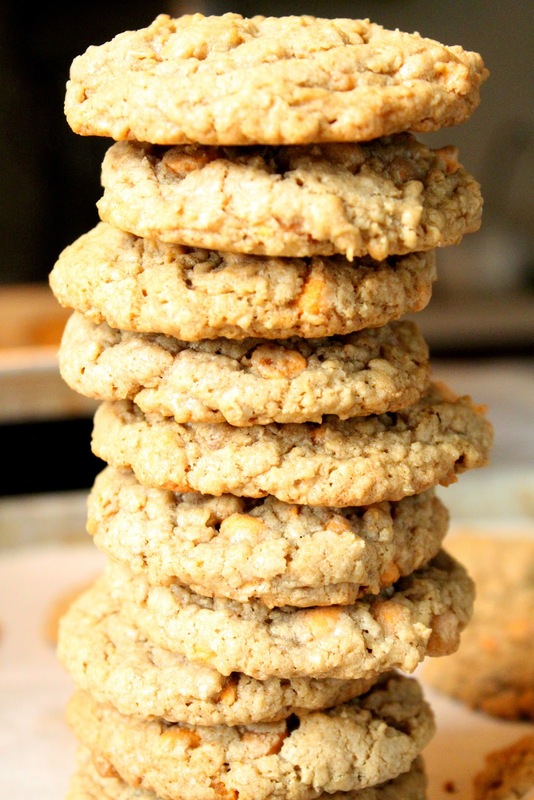 I shared your post with Elaine, the owner at the Mercantile. 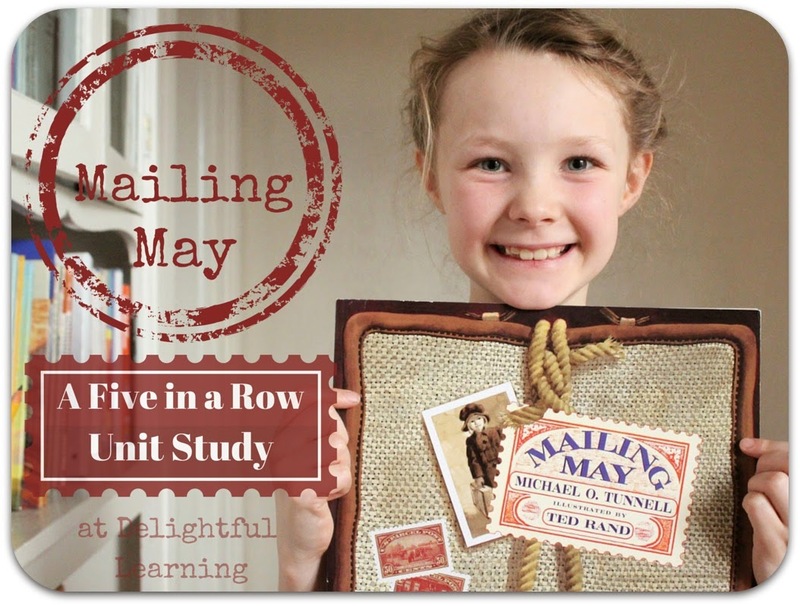 Mailing May was a book I read to my girls in a train depot! We had so much fun. Brings back fond memories.